Train heavy equipment operators with Cat® Simulators M-Series Motor Grader. Provide an easy-to-use, cost-effective and reliable training method before operators train on actual machines. Real controls combined with a virtual construction site create a safe place for operators to experience training exercises such as a Machine Walkaround, Controls Familiarization, Straight Frame Operation, Articulated Turning, Crab Steering, Rough & Finish Grading, V-Ditching, Ripping, Scarifying and an Open Training mode. Plus, record and report each simulator session so operators, instructors and administrators can see the results. Make Cat Simulators a part of your training program today! 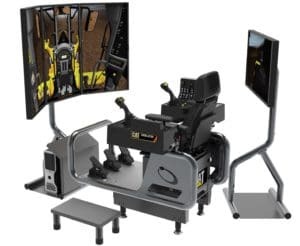 Hardware – Frame and controls needed to operate the simulator, computer, mouse, keyboard, seat, two monitor stands, three 43″ front monitors and one 32″ back monitor. Software – M-Series Motor Grader Simulator software and SimU Campus Training Records Management software. The M-Series Motor Grader Simulator System comes with exclusive companion training material for the iPad. An interactive eBook expands simulator training for classroom or self-study. Topics include safety, maintenance, application methods, video examples, operation tips, how-to images, formulas and more.